Flashback to The Black Hole – Across Utah! It’s somewhat difficult for me to remember a time when I’d set out on a hike with just a text-only guidebook or merely vague directions from an acquaintance. Now, before heading out into even remote locations, it’s possible to scout routes using Google Earth and peruse photos, videos and detailed trip reports from those who have gone before me. In his book Into the Wild, Jon Krakauer noted that Christopher McCandless was on a spiritual quest to find a “blank spot on the map,” and because there are so few of these left, “he made the world a blank spot for himself, by throwing away the map.” Spoiler Alert — that plan didn’t turn out so well for McCandless. So, while it’s true that going “blind” into the wilderness can definitely heighten the sense of adventure, there’s really no sense in taking undue risks. Trust me — there are plenty of surprises in nature without being uninformed about a route. I was reminded of this lesson recently when I found a 20-year-old trip report of mine. Back then I was “outdoorsy”, ambitious and athletic, but I was also quite inexperienced and naive in many ways. My old story shows that the combination of these qualities can easily lead to bad things in the wilderness. Spoiler alert — I survived, but I was fortunate and still think the story serves as a reminder to always be prepared and know your own abilities. Just Do It? The Nike commercials with the sweaty, muscular athletes pushing the limits of human capabilities were on my mind this hot August day near Lake Powell in southern Utah. Bored with the mediocre and our seemingly uneventful life in Los Angeles, my girlfriend and I decided to take full advantage of our week-long vacation. 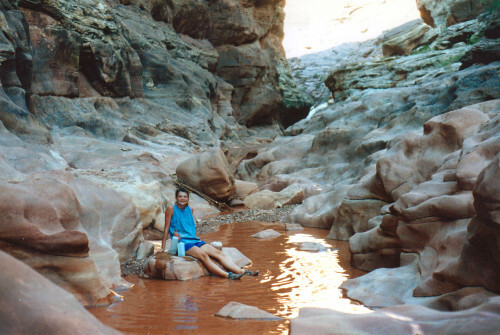 We hadn’t planned on doing any hikes during our two-day stay near Lake Powell, just relaxation and fun in the warm blue waters. 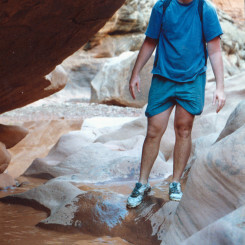 But, plans changed when a ranger told us about a half-day hike down the White Canyon called ‘The Black Hole’. The Black Hole is a slot canyon — a common feature of the Colorado Plateau where water cuts a narrow “slot” through the surrounding bedrock to make room for its passage. 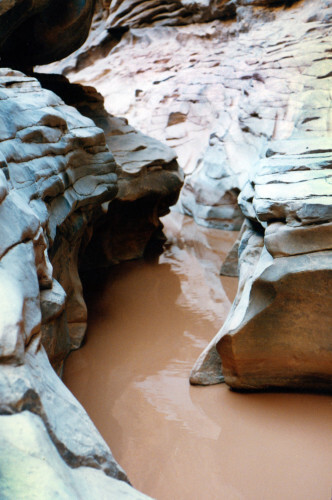 The streams which carve such canyons are small or even evaporate all together until a desert rainfall awakens the hidden power. Some slots seem more like caves than they do canyons as frequently the canyon walls are only an arms-spread apart, though tower hundreds of feet high obscuring sunshine from reaching the canyon floor. The Black Hole got its name for one such stretch that seldom sees daylight. Making for more of an adventure, this section also always has water which is more than six feet deep. And, since there is no sunshine, the water is cold. Even when the temperature hit a scorching 105 degrees at the canyon rim, the water in the Black Hole will unlikely warm past the low 50s. 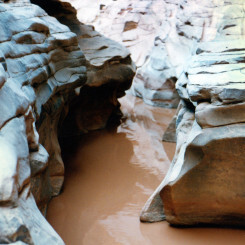 Some type of flotation is required to get past the deep water as the narrow, twisting canyon walls make it impossible to swim in any normal fashion. Out of the diversion ravine, we followed the rim of the main canyon until we finally spotted what looked like another way leading down. As we slowly descended this time we noticed an occasional rock cairn marking this as the true route into the White Canyon. The trail was a fairly steep scramble down part streambed, part rock talus. At one point the make-shift trail shrank to two-feet in width with a vertical wall to the left and a 15 ft. drop to the right. One had to walk approximately ten feet to get past this initiation point. A few more scrambles and we found ourselves at the bottom of the White Canyon, the time was right at 4:00pm. The bottom of the canyon was glorious. Here the inner canyon was about 30′ wide and fairly sheer walls went up about 100 feet and then the canyon widened and towered a couple hundred feet higher. 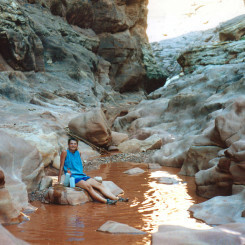 A small red stream trickled through the bottom of the canyon. The rest of the canyon floor was covered with red cracking dried mud and medium-sized water-tumble-rounded rocks, many of which were petrified wood. We hiked about a mile downstream without too much difference in the landscape. We had to repeatedly climb over rockfalls and cross knee-deep water and ankle-deep mud (yep — we didn’t stay dry more than 10 minutes past the initial water bypass.) By now the canyon had narrowed to about 20 feet across and we walked beside a mini-slot where the stream carved 2-3 feet into the bedrock with a smooth curving elegance. It wouldn’t take much rain and the stream would fill this inner slot and overflow onto the bedrock. A moderate rain would do much more than that and the effects of a torrential downpour were obvious as we noted the occasional log precariously wedged into rocks twenty feet above our heads! Another 1/4 mile downstream the canyon began to narrow again. This time it was the main canyon walls which closed in to about 15 feet across. 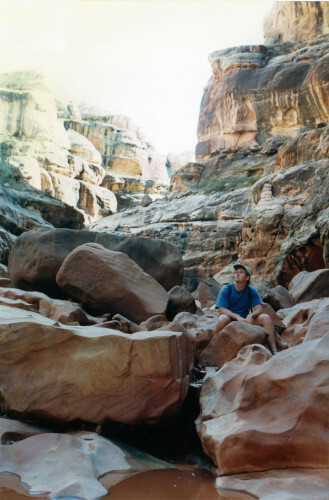 The canyon floor was no longer bedrock, but instead sand and cobblestone. As we waded through the knee-deep water the walls became darker and closer with every turn. We passed a boulder and then the stream-bottom gradually sloped downward into the red cool water. The knee-deep water was quickly on our thighs, then above our waists, and then still getting deeper. This had to be it — the Black Hole. We retreated to the boulder to inflate our small raft which was still wet from the warm waters of Lake Powell. We wanted to take a picture, but the narrow walls prevented enough daylight from entering the canyon to expose my 200ASA film. We ate a snack as we pondered how far the dark chasm extended ahead of us. With the raft inflated my girlfriend jumped in as I swam behind pushing the boat through the canyon which was about 12 feet wide at this point. Around the first corner the water still filled the canyon wall to wall for a stretch of 40 yds or so. As we maneuvered around the next corner I felt myself begin to drag the bottom as I swam. I stood up to realize that we were in knee-deep water once again. We splashed through the water for another stretch and then the canyon widened to a seemingly spacious 25 feet across. The next quarter mile was fairly easy going with more stream-crossings and a few boulder-scrambles, but nothing too bad. We thought the worst was behind us. The time was now 5:30. A little farther the canyon floor returned to solid bedrock, and once again a mini-slot canyon began to form. 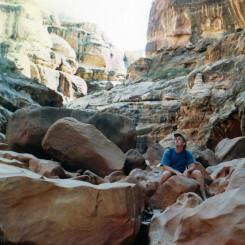 We had to begin hiking in the mini-slot almost immediately as the inner canyon walls slanted steeply towards the slot. At this point the inner-slot was about 6 feet high with water depth ranging from 2-4 feet. We put the raft back into use, though the canyon was so narrow at this point there were points the small raft couldn’t navigate around corners without a serious tug and/or push. This continued for several hundred yards until we met a new obstacle — a small waterfall. Here the canyon had dammed up a deep pool which was followed by a seven-foot drop off into yet another smaller pool. Either fate or an earlier ambitious hiker had placed a large log from the dammed up point slanting downward into the lower pool . The stream water poured off the lip of the dam down the log making what looked like a gut-checking water-slide into the lower pool of unknown depth — however I was not that gutsy. Knowing that our adventure was nearing its third hour I quickly started looking for foot and hand holds to get down the log-ladder. I shimmied about half way down when one of my hand-holds came loose. The hand-hold was part of the dam which constrained the pool above me, so all of a sudden tens of gallons of water rushed down over me as I clang to the log. I successfully held on until the gushing water subsided. However, I soon concluded I could climb no further so I had to slide into the pool below, which ended up being over my head. In the lower pool I was able to set up the raft and provide adequate handholds so that my girlfriend cold safely descend the log. The fun was now over. As we worked our way through bend after bend of narrows we could tell the sun was getting lower in the sky. Though still hours before sundown, the sunshine had begun to take on that hue of the golden hour. The time was now 6:15 and I thought we should be nearing the exit canyon. Around the next bend we met another major obstacle. There was a huge rockfall which completely blocked all paths. The rockfall was fairly old and the stream had since had time to carve its way under it. Without seeing an easy way to scale over the rockfall I followed the stream down through the boulders. I climbed 8 feet down into what was was a tunnel formed by the water rushing under huge boulders. I could see the stream continued into almost pitch darkness through an opening no more than four feet wide. Though it may have been possible to get through I didn’t want to risk it, so instead I returned to my girlfriend who had been scouting for a possible way over the rockfall. After some tedious scaling with moderate exposure we were able to make it past the rockfall. We started to contemplate if it was feasible we had missed the exit canyon. The main canyon had been so narrow it seemed impossible to miss the exit, yet it really felt like we had traveled far more than the 5 miles. We hurried along the flat ground around a few bends to find another major rockfall. This time there was a fairly obvious side route to bypass the rockfall. However, the detour required lowering ourselves down a 10-foot wall with only moderate hand-holds. Other footprints somewhat re-assured us that we had not missed the exit-canyon and must be getting close. We were pleased to find that the canyon somewhat flattened out and we were able to make fairly good time for the next 1/2 mile or so. Though we were anxious to get out of the canyon we were still careful not to be clumsy and twist an ankle or worse as we knew we still had to climb out the exit canyon. Then around the next bend we saw it. We stood there speechless as our mouths quickly went dry. No it was not the exit canyon, it was THE “Black Hole.” All of a sudden the inner canyon completely constricted to a width of about 8 feet at its widest and much tighter at its narrowest points. However, we were really struck with fear because we stood atop the lip of another waterfall looking approximately 10 feet down into this tiny dark chasm. Beyond the pool of water we could see another waterfall possibly 7 feet in height. The dark slot dropped almost 30 feet over next 40 yds before twisting out of sight. Where we stood the stream had undercut the waterfall so there would be no sliding down this time. There was a small boulder on the opposite wall, but I didn’t think it was possible to jump to it and then lower oneself into the canyon. Without any ropes (nor technical climbing skill for that matter) I didn’t see any way to get past this point — unless one wanted to jump into the lower pool which was only 2’x2′ in size and may have been ankle deep water for all we knew. We didn’t want to test this option. However, we didn’t think it was realistic to hike all the way back out of the canyon before nightfall. We considered jumping from the ledge once again, however, we recalled how we naively jumped off the small ledge when we began our hike only to realize almost immediately that it was the wrong choice. Though the exit canyon may have been past the very corner which obstructed our view from what seemed like a flood of sunlight, we were not willing to take that risk. Just as easily there may have been a 20′ drop-off around that corner and by the time we would have gotten to that point there would be no turning back. The time was 7:05. Without much more hesitation we reversed our direction and for the first time along our trek we noticed footprints going upstream. Other adventures must have turned around at that same point. Had we missed the exit canyon? ; Had a recent storm washed away another log-ladder? ; Why would a ranger recommend this hike to two random vacationers? ; How did anyone get past the Black Hole? ; all these questions danced in our heads as we practically jogged back up the canyon. We scurried up the first rockfall without too much effort. However, a little further up stream we found ourselves unable to remember how we got past the several huge boulders which blocked our path. Everything looks slightly different when you reverse course, but the canyon is so narrow how could we not remember coming down these rocks? Then it dawned on me that we were at the bottom of the first major rockfall which had had the tunnel running through it. I could now see where the water exited from below and the passage was too narrow for us to get through which made me very glad I hadn’t attempted that route earlier. We realized we had to retreat 20 yds or so and scale the wall to retrace the detour which we’d taken earlier. Soon we were back to the log-ladder waterfall. By this time our strength was fading as fast as the daylight in the canyon. We floated the raft to the base of the log and tried to get leverage as the red water trickled down on us from above. I was able to help my girlfriend get on the log from which point she was able to scamper up and into the upper pool. Careful not to dislodge any of the dam, she stretched down from the top so that we could relay up the packs and the raft leaving me treading water next to the log. After several failed efforts I was finally able to pull myself out of the water and onto the log. From here it took every ounce of strength I had to get up and into the upper pool. Once on top however, we had no time to rest. With hundreds of bats darting through the canyon we guessed we had less than 1/2 hour of daylight left, so we had to traverse as much distance as possible while we could still see. About 15 minutes later the inevitable happened. As I was climbing over a medium sized boulder I relied on a hand-hold which simply didn’t exist. I fell backwards to the ground about six feet below without anything to break my fall except the ground. I was fortunate to land on 2″ of semi-soft mud and slowly got up with only a sore shoulder. It was at that time we decided that we had to slow down. It was practically dark and now our safety was in jeopardy. We had had the foresight to bring a flashlight with us, even though we had never planned on using it (Fortune #2: always take a flashlight on extended day hikes.) However, it had been in our pack which had been in and out of the water. We had not wanted to waste daylight to stop and dig it out and see if it worked until now. As I searched for the flashlight we discussed camping at the current spot. We still had a few extra bags of fruit, two granola bars and a liter of water. We were also at one of the wider sections of the canyon, though we both knew we wouldn’t be safe if an unforeseen storm occurred. I finally located the drenched flashlight and to our amazement it worked. With the light as our aid we decided we should slowly trod onward — though the odds of a flood were minimal, the consequences were too great. We slowly made our way from boulder to boulder and from pool to pool. The deeper pools now seemed colder than ever in the blackness of night. Though we were both quite hungry, neither of us wished to stop from grinding forward out of the cold dark canyon. We began to worry about the feasibility of us safely climbing out the steep entrance canyon in the dark, or even worse not being able to spot the entrance canyon and continuing up the main canyon into unknown territory. As we had learned earlier the canyon looked very different heading upstream, though this didn’t matter too much now because we could hardly see anything at all. A moment later we were sloshing though knee-deep water when I noticed a branch stuck in mud a few feet away on the side of the stream. It was the branch I’d used to test the water/mud when we first entered the main canyon! I shouted with joy as I told my girlfriend where we were. We shinned the flashlight high on the upper canyon walls and sure enough we could see the smaller tributary canyon feeding in. Beside us was the boulder we had scaled seemingly forever ago in an attempt to bypass the water which we now stood in up to our knees. We laughed and we cried. Though we weren’t out yet, an enormous feeling of relief flooded us. We had been so focused on our goal of getting out we hadn’t had time to be scared, or at least couldn’t afford the effort to express those emotions. Now, without a doubt we were going to make it. It was 9:15. We slowly climbed up the entrance canyon which seemed less difficult going up than it did coming down. Over half way up the side canyon we noticed that the sky seemed to be getting extremely light. At first we attributed it to our elevating out of the depths of the canyon. However, soon we realized that there was a full moon rising behind us on the horizon. We sat down on a flat boulder facing the horizon and broke out our granola bars. Granola bars have never tasted as good as they did as we sat there from our perch watching a full moon rise over the rim of White Canyon. Ten minutes later we climbed up out of the entrance canyon and onto the surrounding mesa. Once again we were overcome with relief and joy. It all seemed so flat and so vastly open, it made one want to outstretch his arms and jump for glory to be alive. A tarantula creeping by shortened our celebration though and so we decided we should get our bikes and head back to the car. It was an amazing ride as we coasted the two miles down to our car. We seemed to float through space as we traveled down the highway as the full-moon almost completely lit the surreal landscape. Without any human lights visible in any direction we felt as if we were on another planet. And if anyone else had seen us covered from head to toe in red mud from the White Canyon they surely would have thought WE were from another planet! A few minutes later we were back at our car and we were happy. It was 10:00pm. 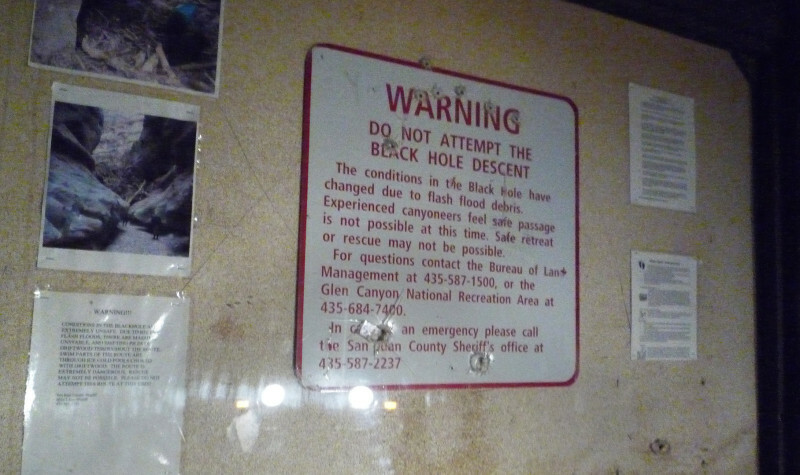 A month after we escaped the Black Hole another group was not so fortunate. A flash flood from a storm nearly twenty miles away trapped a group of twelve hikers in the canyon. One, a teenage girl, lost her life in the canyon. She was caught in a torrent of water and washed down the canyon while the others watched helplessly as they grappled for higher ground. Anyone considering hiking the Black Hole, or any of the other slot canyons of southern Utah, I hope you heed my advice and go prepared. Know the extremity of this environment and know your own limitations. Also, plan the trip carefully and make sure to notify rangers and relatives of your plans. And of course, carry a flashlight, extra food and water and never hike alone. Lastly, if you do make it through the Black Hole — please write and tell me how the heck you did it! Tagged Black Hole, Hite, Slot Canyon, Utah, White Canyon.